Holidaymakers have been advised to check the size of their cabin bags before leaving for the airport. The Northern Ireland Trading Standards Service (TSS) has issued the advice due to consumer complaints and confusion. Passengers claimed they were wrongly charged £50 to put their bag in the aircraft hold due to faulty sizers. But a TSS inspection of 47 baggage sizers at Northern Ireland's three airports found they were accurate but left "little room for error". Inspectors found metal baggage sizers offered just 5mm of extra space, while cardboard sizers were more generous, allowing between 1.5cm and 2cm more than the maximum cabin bag dimensions. In a statement, TSS said it can confirm that baggage sizers currently being used by airlines in Northern Ireland are accurately described and do not breach consumer protection laws. However, a spokeswoman said different size requirements for different airlines were causing passenger confusion. As the holiday season gets underway, the organisation advised passengers to be cautious and double check the relevant size restrictions before travelling. 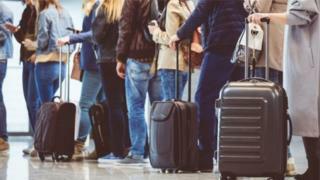 Area Inspector Michelle Craig said: "Given the variation and complexity of luggage allowances across different airlines, it is unsurprising that this causes confusion for consumers. "Some airlines have stated that they now intend to enforce their baggage size policy more strictly than they have done in the past. "Therefore, it is important to be aware that the suitcase you have used to travel with previously, without any issues, could now be checked and no longer accepted by the airline."